Lloyd “Snowball” Severud was always a popular figure because of his personality and enthusiasm. During the mid-1960’s he accepted the position of Head Coach of the Canadian Amateur Ski Association’s jumping program and coached the Canadians during the 1968 Winter Olympics at Grenoble, France. He is also credited with rejuvenating ski jumping in Canada. Lloyd “Snowball” Severud was born near Chetek in Northwest Wisconsin and attended high school there. Dedicated to and participating in skiing all his life, he began competing as a nine year old boy. As a junior competitor, he skied for clubs in Chetek, Cameron, Ridgeland, Washburn and Strum, all in the Wisconsin snow belt. The nickname of Snowball did not come from his association with skiing. A towheaded youth, Severud was christened Snowball by a high school basketball coach. Following four years with the Marines during World War II, Severud joined the Eau Claire Ski Club in 1946. Always a popular figure because of his enthusiasm and personality, “Snowball” made the Class “A” ranks in the late 1940’s but did not become an outstanding national ski jumping figure until he entered the Veteran’s Class. He went on to win five National Veterans’ Class jumping championships (1953, 1956, 1957, 1958 and 1959). During this time he completely dominated his class in tournaments across the nation. Highly regarded for his knowledge of the sport, Severud served as the Eau Claire Club’s unofficial coach. In the late 1950’s he served as coach of a Midwest training camp at Duluth, Minnesota and became respected as a jumping instructor. In 1959 he accepted the position of Head Coach of the 1960 United States Olympic Team for the Winter Games in Squaw Valley, California. The United States received one of its highest finishes in modern times that year when Ansten Samuelstuen placed seventh in the 90-meter-hill competition. Severud was instrumental in getting action films into the daily routine of the training camps. He continued to coach and was an authority and advisor in United States skiing. During the mid-1960’s he took the position as head coach of the Canadian Amateur Ski Association’s jumping program and coached the Canadians during the 1968 Winter Olympics at Grenoble, France. He has been credited with rejuvenating ski jumping in Canada. Severud retired unofficially as a competitor in the mid-1960’s. A real student of the art of ski jumping, Snowball studied jumping techniques of the Europeans at two Olympic games and was confident that he could help bring the caliber of North American ski jumping up to that of the Europeans through new ideas. 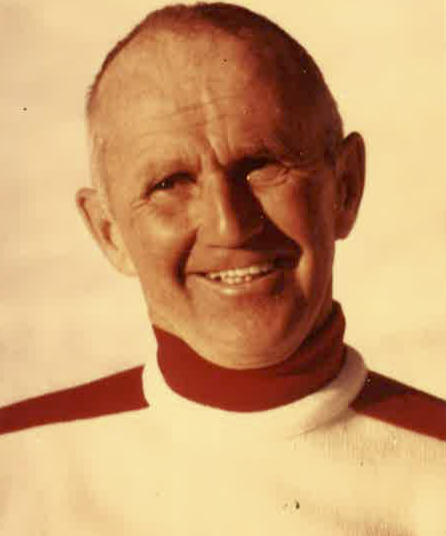 Lloyd Severud was elected to the U.S. National Ski Hall of Fame in 1970. If you notice any errors or inconsistencies in Lloyd Severud's bio, click here to let us know.